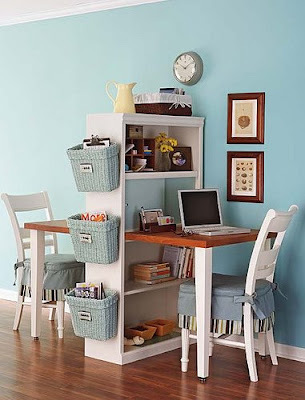 If you blur your eyes and ignore the colour palette reminiscent of an 80's bed & breakfast, this do-it-yourself bookshelf desk for two people (official name) is pretty inventive. Good for small flats or non-cubicle offices. This is the cutest thing I have ever seen. I am going ot have my husband make one for my two sons home-school desks. So much better than the kitchen table. This is really cute and really fits small appartments. It's a nice way to have a study area in a two bedroom flat. This is a really nice pick!